For 4 years of my architecture life, I've been constantly eating Face to Face at campus. Mainly because there is nothing else better to eat. It was either that, Subway or Korean food; which is quite sad for such a large campus. Anyway, apart from the usual Face to Face, Pondan Noodles or JoJo Pan Mee, there is a new noodle shack in SS15 called QQ Noodle House. The reason behind the name QQ, well its to indicate the bounciness and spring-like texture of the noodles served. The front entrance. Vibrant purple signboard that you'll definitely not miss. We started off with some of their drinks. Everything was relatively simple. The honey lemon was pretty good, not too sweet or sour. 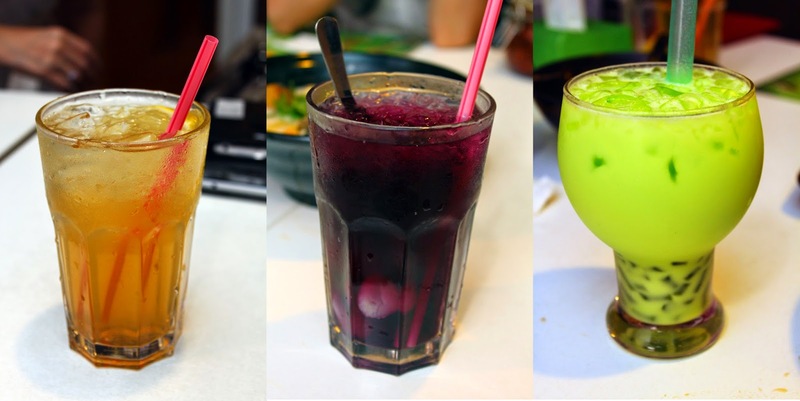 I loved the Ribena longan but then again, I do enjoy Ribena on its own; so its probably biased. The Honeydew Milk Tea was a little sweet for me but I do enjoy the jelly-like thing at the bottom of the cup. Yes, the name does sound funny but it literally translate into "Wong Zao Kai" in Cantonese. Anyway, the soup was clear and broth-like but lacking in that extra alcoholic punch. I would prefer it if the wine/alcohol was more noticeable but nevertheless, it was a pretty good bowl of soup. The mee sua noodles were cooked consistently; no signs of sticking or mashing. The chicken strips were very tender and moist and the wolfberry gave it extra sweetness. First and foremost, the soup was a little sweeter than usual, however, that can be compensated with additional sambal-chili to make it spicier. The noodles were really bouncy, different from what I normally have at the hawker stall. Overall, the noodles were pretty good and does compliment well with the soup, just needed that added depth of spiciness to it. Served with prawns, half an egg and kang-kung. This was probably the best I've had during the afternoon. Rich, clear, smooth and savoury soup with well cooked noodles. The fish was fresh and fried to perfection, both flakey and crispy with flavour. The balance of acidity, sweetness and milkiness was notable. The seafood tomyam noodle was pretty unfortunate. Despite looking forward for this particular bowl of noodles, it was rather bland. The flavours were flat and lacking of depth. Anyone could tell it was tomyam soup but it just could not stand out. Will be back again to try this in the future to seek further improvements. The regular pan mee, like in many other places, is served with a variety of optional chilies as a form of mixture. Do note, QQ Noodle House has one of the spiciest chili mixture. For those who can't take as spicy, it is recommended to mix several chilies together. By doing so, you may find the right balance for your palette. Besides noodles, QQ Noodle House also offers a range of side dishes to compliment. This is one of my favourites, the prawn roll - but does not look like roll. Basically shrimp paste wrapped in bean curd, fried and sliced. The beancurd itself was crispy as hell. The paste was chewy and springy which goes well with a glass of cold beer. Lots of flavour, multiple textures, loved it. Similar to the prawn roll, this was also pretty good. The paste was bouncy and the skin was fried to perfection. However, if compared to the shrimp roll, I still prefer that more. In conclusion, most of the noodles here were pretty good, along with its side dishes. The prices were affordable as well, ranging from RM7 - RM14 per meal. Loved the prawn roll, will definitely recommend that!